Slough Jets returned to action after their winter break by welcoming the Telford Tigers to the Hangar. Telford took a lead they weren’t to lose at 6.08 when Jaroslav Kruzik scored the opening goal on the powerplay. His was followed by Miika Kiviranta at 11.30 and Nathan Salem at 12.52 for a 0-3 opening period. The second period also started well for the visitors with Callum Bowley netting at 22.27 before Andrius Kaminskas scored the opener for the home team at 24.04. A quick goal from Michal Pavlu at 24.43 restored the four goal cushion and his was followed by a powerplay goal from Timo Kuuluvainen and 29.18 and a powerplay goal from Joe Miller at 31.06 before Kamil Tvrdek scored at 37.18 to make it 2-7 heading into the second break. THe only goal of the third period came 38 seconds in when Bowley netted his second strike, this on on the powerplay. The final 8.43 saw the visitors swap their netminder who closed out saving the 1 shot he faced. Slough Jets started 2013 with a local derby match against the Bracknell Bees. Slough started the game with a well taken goal from Dan Rose at 3.58 and both teams traded powerplay chances before then opening frame ended 1-0. The intensity upped in the middle frame as did the scoring. Slava Koulikov made it 2-0 at 25.07, followed 80 seconds later by Matt Towalski for 3-0. Martin Masa pulled a goal back at 26.56 before Darius Pliskauskas scored at 29.32 to make it 4-1. Sam Godfrey came off best from a tussle with Tom Fisher sparked by a Scott Spearing check from behind and Mindy Kieras scored on the resulting powerplay at 30.20 before Masa netted his second at 31.27 and the middle period ended 5-2. Slough netted another powerplay goal when Tomas Valecko scored 2.10 into the period but Matt Foord bagged a powerplay goal to make it 6-3 at 44.49. Lukas Smital netted an even strength goal at 47.44 making it 6-4. A charge from Scott Spearing then provoked a tussle between him and Michael Wales which saw the Slough player come out on top and Slough closed out the game for 2 points and the first win of the year, keeping their unbeaten record this season against their nearest rivals. Slough: Scott, Wales, Greener, Barker, Davies, Godfrey, T Miles, Towalski, Rose, Pliskauskas, Kieras, Milton, B Miles, Valecko, Koulikov, Bakrlik. Bracknell: Turner, Lamey, Galazzi, Munroe, Thompson, Foord, Oakford, Johnson, Masa, Smital, Ambler, Spearing, Strycek, Bronniman, Fisher, Annetts. 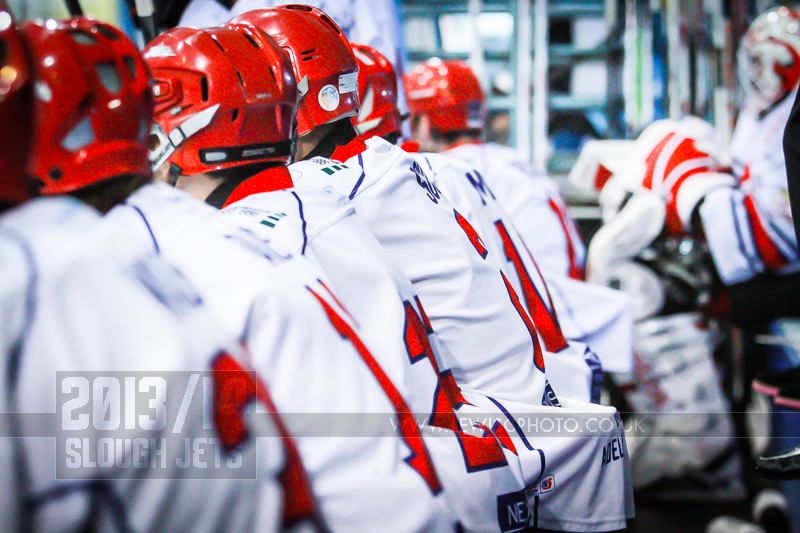 Slough Jets welcomed Swindon Wildcats to the Hangar for the opening game of 2012. Slough enjoyed a fast paced start to the game and an early powerplay allowed the home team to play offensively but it was Jonas Hoog who netted a powerplay goal against the run of play to put Swindon ahead at 13.13. Slough continued to play well and got reward at 19.11 when Adam Calder netted the equalising goal and took the teams to the interval tied at 1-1. Just 2.54 into the second period Doug Sheppard put Slough ahead with a powerplay goal before Aaron Nell equalised at 25.20. A coming together in front of the Swindon bench saw Ryan Watt and Sam Waller ejected for Slough and Jaroslav Cesky, Jan Melichar and Nicky Watt ejected for Swindon. Darius Pliskauskas netted on the resulting powerplay to make it 3-2 and although the teams traded 2 minute powerplays there was no further scoring leaving it 3-2 at the second interval. The third period was all Slough with the home team netting 4 unanswered goals. A slashing minor to Alex Symonds saw the home team add two more to their tally with first Mindy Keiras at 42.54 and then Sheppard at 43.33 netting shorthanded goals making it 5-2. Pliskauskas second goal at 47.51 made it 6-1 and he then netted again at 54.55 to complete his hat-trick. 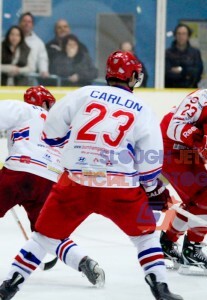 Slough Jets second home game of 2012 was against the Manchester Phoenix. The third period saw Slough determined to force their way back into the game and a penalty at 52.06 to the visitors offered them a powerplay chance and Joe Greener capitalised at 52.29 with a goal scored on the man advantage. Manchester called their time-out as Doug Sheppard picked up a penalty and Slough called their time-out with 60 seconds remaining. Gregg Rockman left the net with 55 seconds left but Jaroslav Spelda scored at 59.46 into the empty net to secure the game. 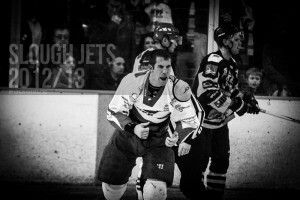 Slough Jets and Peterborough Phantoms clashed at the Hangar in what turned out to be a 65 minute plus 17 goal game. The game got off to a cracking start with the teams trading goals. Slough scored first through Ryan Watt at 2.17 but Tom Carlon equalised at 6.49. The yo-yo continued as Slava Koulikov made it 2-1 at 11.12 onto to see Carlon’s second equalise the game at 11.50. Darius Pliskauskas netted an unassisted goal at 12.58 to re-take the lead but Jeff Glowa netted a powerplay goal at 14.43 to tie it at 3-3. Peterborough enjoyed the second period at Joe Miller made it 3-4 at 21.16 before Doug Sheppard scored for the home team at 21.41 levelling it up. The visitors then edged ahead with unanswered goals from Miller (23.18), Yardley (23.37) and Ferrara (31.29). 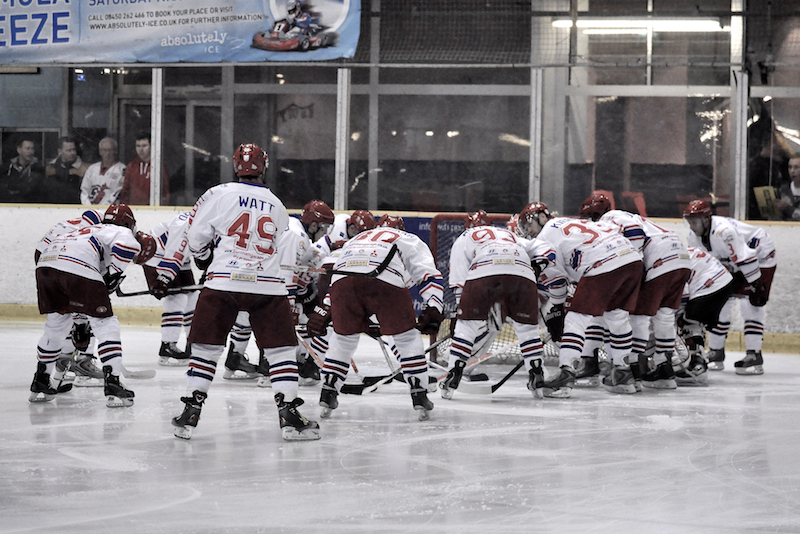 Yardley’s goal had seen Peter Russell call Slough’s time-out but the visitors took the period 1-4. Slough pulled a fantastic comeback out of the bag in the third period sparked by Joe Greener netting on the powerplay at 48.21. Pliskauskas scored at 49.15 to make it 6-7 before Zeidins converted a pending powerplay into a delayed penalty goal at 55.01 to restore a 2 goal lead. Undaunted Ryan Watt pulled a goal back on the powerplay at 57.20 and with Gregg Rockman out of the net the extra attacker helped Paddy Ward level the game with just 21 seconds of regulation time remaining. Neither team could break the deadlock in the 4 on 4 overtime and it came down to penalties to decide the result. Koulikov opened the penalties successfully and Rockman denied Lellenas. Damien King then saved from Dan Davies while Zeidins scored at the other end making it 1-1 after two shots. Doug Sheppard buried his shot and the home team and fans erupted when Rockman saved Glowa’s effort. 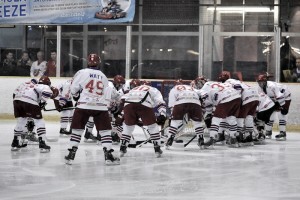 Slough Jets started 2010 by playing against Sheffield Scimitars in the EPIHL. Before the game Slough Coach Peter Russell was joined by Ciaran Long and the members of Sheffield who also played in the GB Under 20s game for a Gold Medal photograph. After a fairly even start with both teams having chances it was Slough who went short-handed at 10.23 when Jan Melichar sat out an elbows penalty but that also saw the home team open the scoring with Ciaran Long scoring at 12.18 shorthanded. Slough edged the period 1-0 despite sharing 20 shots equally. The second period saw Slough really dominate as they racked up 13 more shots on goal than the visitors. Dan Davies netted at 26.42 to double the lead and just after half way Slava Koulikov made it 3-0 at 31.52. Michael Bowman scored the final goal for Slough at 36.24 making it 4-0 and giving the home team a comfortable margin at the second interval. The third period saw Sheffield outshoot Slough and while Ben Bowns in the visitors net saved his 10 shots Gregg Rockman finally had his shut-out broken at 44.34 with a powerplay goal from Mark Stewart. As time ticked out the game Sheffield called a late time-out with 119 seconds left but Slough completed their 4-1 victory.